Quartz is naturally hard and scratch resistant. It ranks a 7.0 on Moh's Hardness Scale, which is used to measure the scratch-resistance of a material. Only diamonds, ranking 10, topaz, and sapphire are harder than quartz. Granite is ranked 6. Quartz counters are manufactured with nearly 100 percent quartz. In contrast, granite may contain only 50 percent quartz. The other minerals found in granite leave it soft, porous, and vulnerable to scratches and stains. Industry-wide, all quartz countertops are made with 93 percent quartz or they cannot claim the hardness, durability, or impermeability of a true quartz surface. The prescribed mixture results in a product that is non-porous, exceedingly durable, and more than twice as strong as granite. While granite is subject to unpredictable variations in color or pattern between slabs, making matching of sections of a countertop difficult, engineered stone is uniform in color, pattern, and texture. It provides nearly all of the benefits of natural stone but with few of the drawbacks. 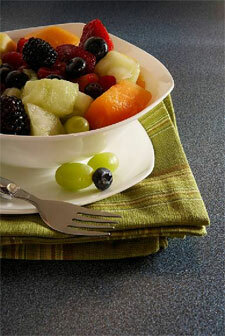 Quartz countertops are tough enough for the wear and tear on just about any interior surface. Engineered stone won't develop fissures or cracks and remains impervious to water, moisture, or bacteria and is twice as strong as granite. There is no safer food preparation surface on the market today. This product resists stains, and is non-porous so typically, bacteria cannot grow on this surface.